Classically made with small marble table tops, bistro tables were a contrast to the traditionally heavy wooden tables seen in taverns or common houses. Positioned along the footpaths and courtyards of the small venues to extend their seating spaces, the bistro table offered the perfect spot to people watch whilst enjoying the classic combination of coffee and croissants. As bistros gained more popularity, the tables evolved, larger models were being seen with folding base mechanisms for easy storage. Marble tops were being switched for wood, slats, stone, concrete and metal. Table bases could be decorative iron frames, wooden legs or simple central column supports but all still held true to the tradition values of a practical table deigned to break from the traditional pub style furniture. Today, bistro tables take many forms, and fit many budgets. From the independent cafe on the high street, to the high end boutique wanting to make a statement about design. With many options and different designs available, its a versatile option for any venue. Wipe clean finishes and folding bases make metal bistro tables an obvious choice for somewhere looking for easy care solutions, and with a huge range of colours to choose from they can change the look and feel of a space without a huge expense. 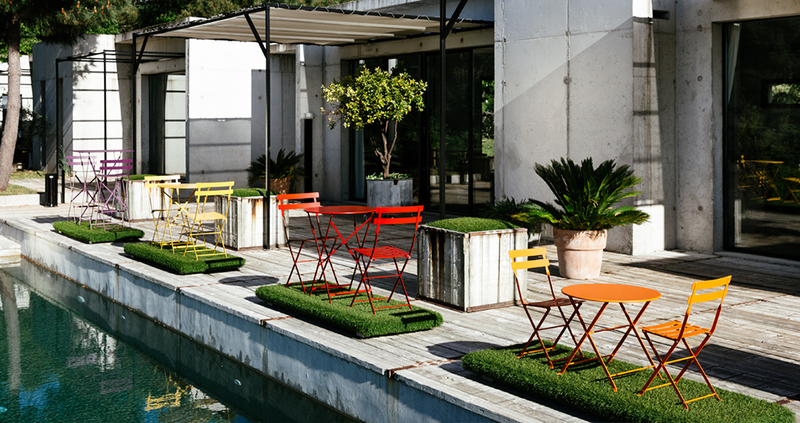 Suitable for indoor and outdoor use, metal bistro tables come in all shapes and sizes, and in many finishes. They offer design versatility and could be used to achieve an ‘outside in’ effect or to bring a vibrant and modern feel to your venue. Pair with a matching bistro chair or contrast with a different finish to achieve multiple looks. Go classic french romantic with the 1900 range or a more modern look with the capri selection. Ideal for a venue with heavy footfall, they can be quickly wiped down and cleaned between customers, are lightweight meaning they can be easily moved to suit evolving floor-plans and with various options for folding and stacking models they are perfect for reducing storage requirements. With more of a classic look and feel, wooden bistro tables have simple lines paired with styled back finishes to produce elegant and timeless pieces that would complement any environment. 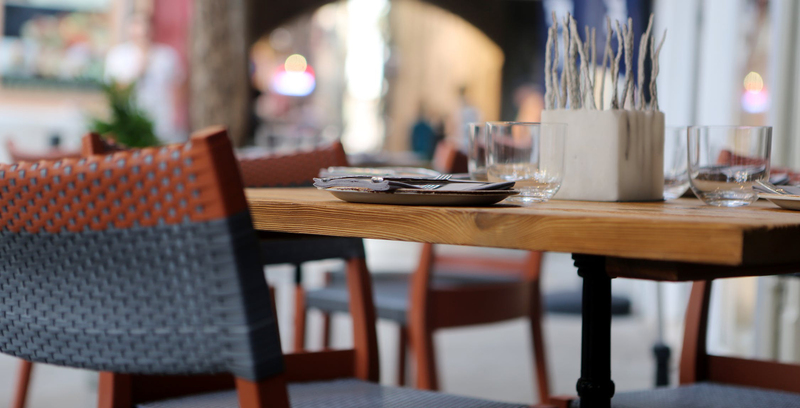 With a higher price point than metal bistro tables, wooden bistro tables are suited to venues wanting make a statement about design and utilise furniture that reflects this. Available in classic designs or contemporary styles, they are perfect for venues with slightly bigger budgets. With multiple finishes to hand, they can be incorporated into any design, and with our bespoke table top options and NOROCK table bases you can even design something that perfectly fits your deign requirements. Looking for a modern table with a simple but elegant design? Look no further than the Vicky table. Or if you want something better suited to outdoor use, then try the Terrace Teak range with matching bistro chairs. 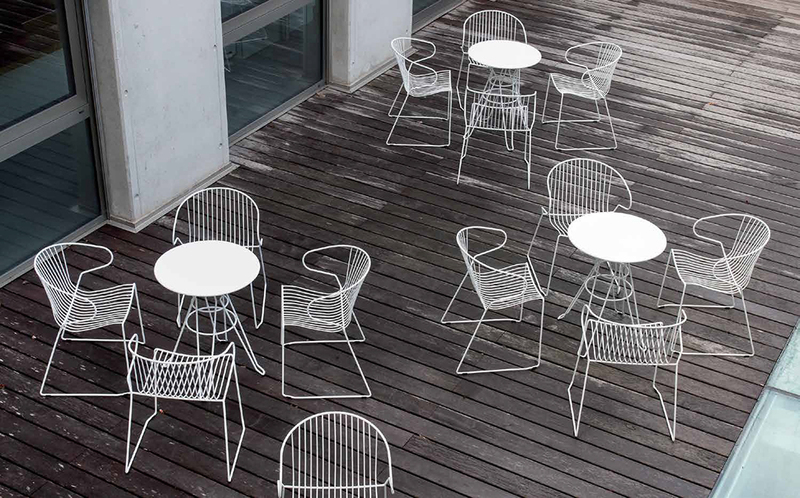 Outdoor bistro tables have been designed to tough the elements, and with folding and stackable models available they are perfect for storing away when not in use. Available in a range of materials including; metal, wood, plastic and rattan, you are sure to find the right product for your venue within our range. Perfect for extending your seating capacity or drawing in ‘Al Fresco’ dinners in the summer months, outdoor bistro tables can be a cost effective way to boost profits and take advantage of good weather. Worried about an uneven surface when choosing your tables? Then our NOROCK Terrace table base could be the perfect answer. Its includes a flip top mechanism and a ‘stacking’ leg meaning they can stored away when not in use. It can also be paired with a bespoke table top in a material and design of your choosing making it a great choice for a bistro table. Shape can play a massive role on perceptions and peoples actions. Round tables are more welcoming than square tables and can encourage consumers to feel more at home. Subliminally they encourage lone dinners into a venue if seen from outside and has the added effect of making people look less lonely when sat at a round table. They also have the added advantage of being flexible in terms of seating numbers, size will restrict but the lack of edges means more people can sit causally around one table than the sames sized square alternative. With many options available, and our bespoke table top service, you can choose from marble, stone, wood and metal to create the look you are wanting to achieve, even adding quirky and unique elements to give your venue the edge. 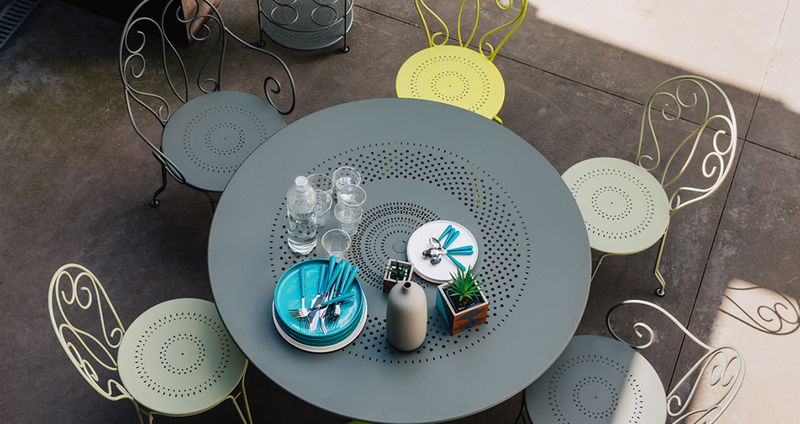 Round bistro tables are commonly seen lining the streets and courtyards of cafes and bistros around the world, so are a popular and well placed choice. The bistro table is the most versatile item of contract furniture, used as a dinning table, side table and temporary seating solution for many years, and will stay in use for years to come. Its the ideal solution for venues looking for a small, and practical table. With so many options in terms of design, function and finish the design choices are almost endless, so speak to one of our sales team for advice on whats right for your space and requirements. Get in touch to discuss your specifications and requirements with us email: info@hillcrossfurniture.co.uk or call +44 (0)1325 378307 and one of our sales team will be happy to assist.